December | 2010 | can i just finish my waffle? I was reminded today about the manatee seeking warmer waters in the winter, which in turn reminded me of the many places where they can be found. I can well remember as a child visiting Manatee Springs (better know as just Manatee). This was when it was found in the middle of the woods only accessible by a two rut road that seemed to go on forever. Of course, now it is easily visited with a nice paved road, but still has untouched woods within the park area. 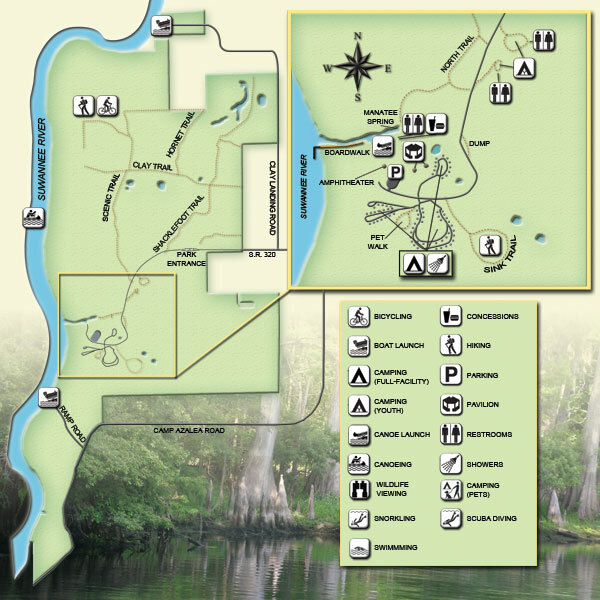 For millennia, Manatee Springs and the surrounding area have provided a home site and livelihood for humans. Artifacts found in the spring and adjacent areas indicate that people have been living and raising their families here for at least 9,000 years. The arrival of Spaniards during the 1500s brought an end to a series of cultures that lived in harmony with the earth for thousands of years. In 1774, William Bartram, a naturalist, botanist and artist, traveled through the area while exploring the Southeast. Later, he wrote a book about his travels, in which he described Manatee Springs in detail and noted the presence of manatees. The first-magnitude spring at this park produces an average of 100 million gallons of clear, cool water daily. It’s cool, it’s crisp, it’s winter in north Florida! So far it has been quite chilly and dry. This means manatees need the warmth of the springs, and because the levels tend to run low, they prefer to bask where the spring meets the Suwannee River. There they are bathed in the warmer waters that rush from the spring into the calmer river flow. 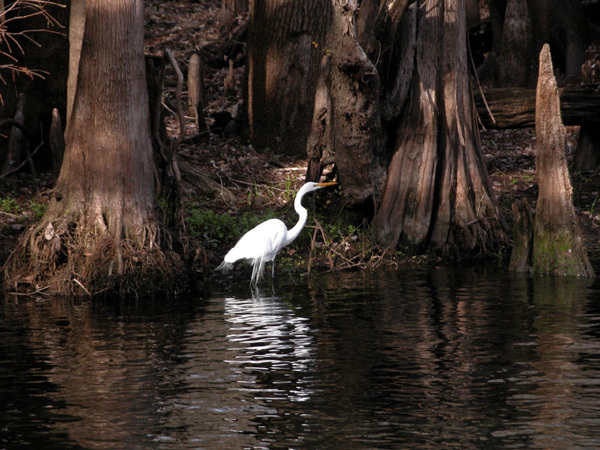 If you love the outdoors, and a real experience in Mother Nature’s world, you will find beauty at Manatee Springs in any season. Enjoy the campground in the woods, where wildlife is very abundant. Swimming is always open and quite an experience when the air is cold and the water feels warmer. January is Manatee Awareness Month at Manatee Springs. Special programs each Saturday starting January 8th. Well, back to the down and dirty tricks and maneuvers of the 111th congress. They stop at nothing, including deceit and malpractice. I was trying to follow the food safety bill (S510) which was tacked onto the Omnibus bill (HR3082) to get around a constitutional issue – the Omnibus bill that was stopped in the Senate. It was at this point that I lost track of it. Take your eyes off the ball for a minute and you can’t even find the ball. The following is the best I could come up with as to what happened to it. Needless to say, they found a way to pass it. I think my thread ran out with it on the way to the president for signature. Which I know he did sign even though I can’t find that verified. The House passed a sweeping food safety measure last summer. But that bill wouldn’t fly in the Senate. So the House had to give in this fall and accept a scaled back version from the Senate. The Senate had to overcome numerous procedural hurdles to get its bill through in November. There were financial objections from Sen. Tom Coburn (R-OK) and Democrats had to put off Sen. Dianne Feinstein (D-CA), who wanted to ban the chemical BPA from baby bottles. Then it turned out the Senate screwed up and included language in its version that were technically supposed to come from the House first — i.e. revenue raising provisions. So the House fixed that and passed the Senate food safety bill again – this time as part of a bill designed to keep the government running through February known as a continuing resolution, or CR. But late last week, Senate leaders feared that resolution might get snagged, so the food safety bill looked like it was in jeopardy again. Once again, outgoing House Speaker Nancy Pelosi, along with her sidekicks Waxman and Dingell, has used legislative “sleight-of-hand” to force through the “Consumer Assistance to Recycle and Save Act” (H.R.2751) with S.510 attached. Just today, the Bill passed on a vote of 215 For and 144 Against. It is rich irony indeed that the “Cash for Clunkers” reauthorization bill (H.R.2751) has provided the ride for S.510, another “clunker” that will unleash an avalanche of useless, business-killing paperwork upon the food industry and a swarm of parasitic FDA bureaucrats. The result will be, as we have said all along, a food supply that is less safe, more expensive, and less abundant. Anyone who thinks otherwise is living in complete fantasy land. So S510 became a part of Omnibus, that is, until it failed. Then it became a part of H.R. 2751 – a bill on recycling which has nothing to do with food safety. I’d like to see a little diagram of how this bill became a law. And what was the roll call vote? I don’t know. That will take more research. on a snowy Cbristmas night. It’s always interesting to review what has been said in the past, what has been promised. When is a lie not a lie? Below a discussion back in 2009 on Chris Matthews Hardball about the same subject, earmarks, . Nothing has changed. Notice the excuses that were made back then. What are the excuses this year?? I’ll bet you if John McCain were president today, he would not sign a bill filled with all this pork. The only thing I can see that has changed since 2009 is an election took place in November, and the republicans took the House taking 63 seats. So let’s put a hold on this and let’s see what the new congress will do. Posted: 12.16.10 Update: 12.16.10 @ 9:00 p.m.
Senate Minority Leader Mitch McConnell (R-Ky.) introduced a one-page continuing resolution Thursday that funds the government through Feb. 18th. Exactly what I was thinking they should do. The democrats have presented a false choice – either accept their bill for the entire year of 2011 filled with over 6,000 earmarks, or shut down the government. This is the solution. It’s a good common sense solution. Continue to fund the government through February when the new congress, elected by the people in November, can take up the issue. Yea!! Republicans with some Back. Bone. Love it. According to The Hill, Senate Republicans are going through with a plan to have the entire omnibus spending bill read on the Senate floor, a feat that won’t be completed for 50 hours. Republicans have vowed to vote against the 1,924-page, $1.1 trillion bill that is loaded with billions in earmarks. That would mean any Senate business would be stalled until Saturday evening. Now you’re talking. I’ll stay up and watch.